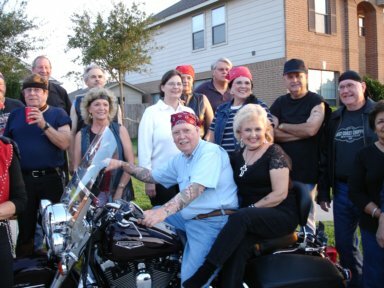 Many will recall the Bikers and Babes party that I co-hosted last year with my dear friend, Earnest Dew. I am very happy to announce that our sweet friendship has developed into a full blown romance and we are engaged to be married. I had the pleasure of accompanying Earnest to Florida in May to attend his granddaughter’s Cinderella wedding at Disney. It was an incredible experience. The following excerpt is from the Katy Times. Miss Mary Marissa Dew and Mr. Calvin Edward Draheim were united in marriage on Saturday, May 2, 2009, at five o’clock in the afternoon at the Wedding Pavilion located on the Seven Seas Lagoon in Walt Disney World, Lake Buena Vista , Florida . The bride arrived at the double ring ceremony in Cinderella’s glass coach drawn by six white ponies complete with two footmen. The service was performed by the Reverend Jack Day, a long standing Disney officiate. The ceremony incorporated traditional wedding music with the charm of various Disney melodies as well as religious pieces presented by two of Disney’s Epcot singers. After the ceremony the bride’s parents hosted cocktails then dinner and dancing at the Grand Floridian Convention Center. A highlight of the reception was the one-of-a-kind, 7 feet tall, fairy tale wedding cake created by Chef Richard Roman and his Disney team. The cake incorporated the couple’s last initial and included elements of the bride’s wedding gown. It was lavishly embellished with delicate sugar floral and Swarovski crystals were interspersed throughout. The confectionery was topped with a solid white chocolate replica of Cinderella’s castle and served on plates featuring the bride and groom’s monogram. The day before the wedding the bride’s mother hosted a brunch in honor of the bride’s party at Citricos located in the Grand Floridian. Guests dined on Tinkerbell’s Buffet and special entertainment included a Disney silhouette artist. On the eve of the wedding a tropical themed rehearsal dinner was held in the Living Seas Salon in Epcot. While guests dined on The Lady and the Tramp Buffet, special appearances were made by Disney divers, amazing sea creatures and Mickey and Minnie to the delight of those in attendance. Other highlights included the couple’s signature drink, “Fairy Tale Fantasy,” and a photo montage. Marissa is the daughter of Susan and Lyndol Dew of Katy, and granddaughter of Earnest Dew also of Katy.. Since then, he has presented me with a stunning engagement ring, and we are rapidly making plans for our wedding and move to Florida. As many know, I have been widowed for 15 years, and never wanted to date anyone after losing my sweet Bob, and certainly never entertained the thought of marrying again. But God is good and He truly has a plan for our lives. My only regret is leaving my darling, little Austin, now 9 years old, but he is excited about visiting Grandmother and going to Disney. I look forward to coming home at Christmas and again in April for our 50th class reunion. Love to all my fellow Milbyites. Click here to view all of the pictures and read the story in the "Bikers and Babes" photo album. Click here to read Charlotte's biography and to see photos of her precious grandson Austin. Charlotte, first please accept my congratulations, he must be a wonderful guy. Second, how could you leave the Harley behind? It's a part of the family, don't you know! Please let us know where in Florida you will be settling, Linn and I frequent her brother in Jacksonville often, and perhaps we could make a detour and visit the newleyweds!!! Congratulations, Charlotte. I think it's wonderful that you have found someone at this stage of life. I wish you many, many, many fabulous days ahead. Our new home will be in Newberry, Fl, a tiny suberb of Gainesville, about 135 miles north of Orlando. We are excited about this new adventure and are looking forward to many visitors from the Lone Star State. I've already started gathering Texas memorabilia to take with me. How wonderful! So, so excited for you. Have you set a date? Keep us informed as we all love a true Cinderella story. Wishing you many, many years of love and happiness. No, we haven't set a date yet, but looking like it will be mid October. We have a lot of loose ends to tie up first. I can't imagine moving so far. Frightening and at the same time exciting. We are like 2 teenagers as we make plans for the adventure ahead. Hello Charlotte! This is great news and I am so thrilled for you. I can't even imagine you on a Harley! But God is awsome and He knew you'd have to love one to meet your Earnest and share that part of his life! On the other hand, maybe He had to learn to love a bike to find You! HA! Anyway, I do know that God gets the glory either way! I have so many wonderful memories of you from days gone by...I wish you love and happiness and a blessed life together.